The past week our town has been having its annual Riverfest celebration, basically just a big party along the river that goes through town. You have to buy a button to get in and then there are a lot of free things to do. There are some not free things also. 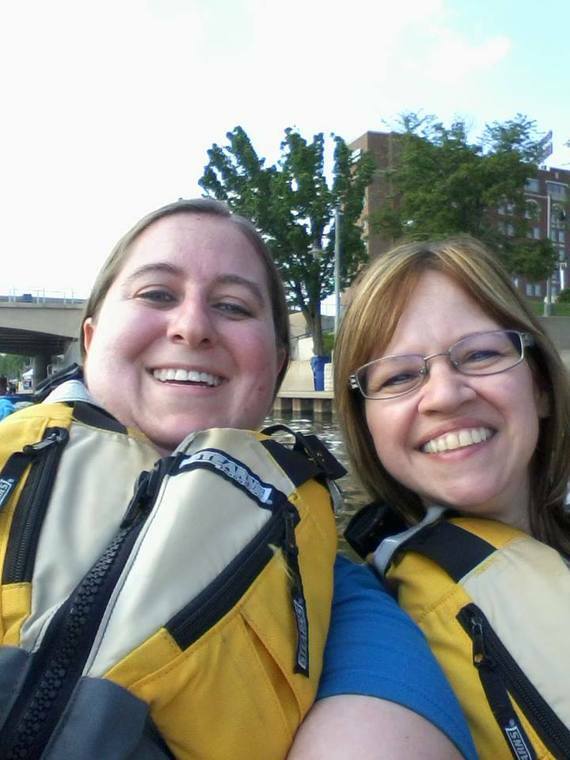 I have a friend at work, Nikki, who told me before Riverfest started that she wanted to go paddle boating as it is her favorite thing. If you don't know what a paddle boat is, it is a small fiber glass or plastic boat that seats 2 people side by side. they have what is similar to bicycle pedals in front of each person that are used to turn a paddle to make the boat go with a small handle to steer it. When Nikki told me about her desire she told me that she normally ends up having to go alone as she never has anyone to go with her. I thought about offering to go at the time but I was just getting over being sick. After the weekend passed and we were back at work I asked her if she had gone to which she told me no and wasn't sure if she was going to because she would have to go alone. Since I was feeling better I asked her if she would like for me to go with her. She brightened up but asked if I really wanted to. I said "Nikki, I want to go paddle boating, do you want me to go with you?" She still waffled a bit thinking I was just offering to be nice and I told her, "Nikki if you want to go we'll go, I'll call my husband right now and tell him he doesn't have to pick me up after work and we'll go as soon as we're off". She still waffled a bit but told me that she had an extra button I could use so I wouldn't have to go buy one and I finally convinced her then she said tomorrow, my extra button is at home so we'll go after work tomorrow. I said ok and she said "It's a date!" Turns out it was a good think we didn't go on Tuesday because they didn't have the boats running due to high winds. But they were going on Wednesday when we got there! Of course they make you put on a life vest. I know they have to, but I still felt silly since I've been swimming since I was in diapers. 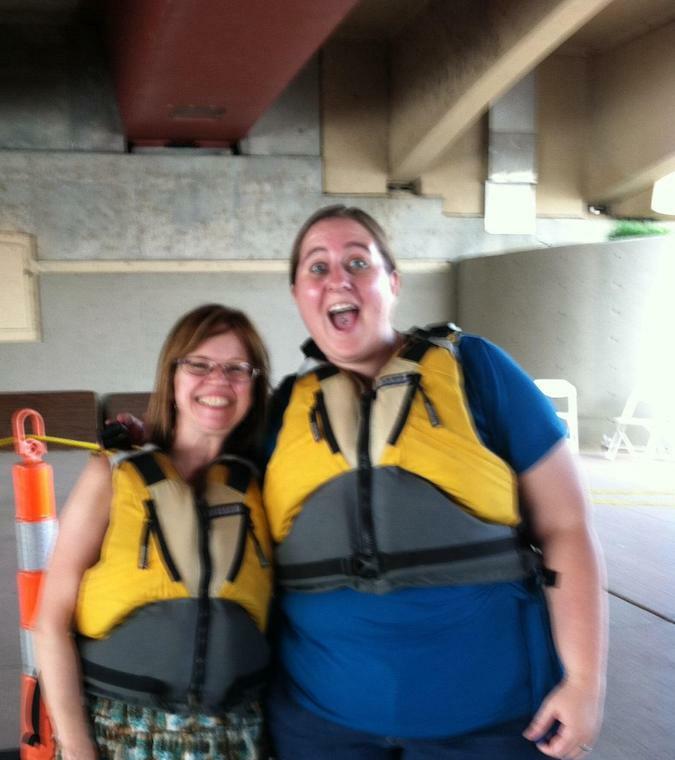 And the vest fit fine while I was standing, not so fine once I sat in the boat as it pushed up around my head. That along with the fact that my legs were a bit long to peddle properly made driving it difficult but we managed and had a really good time. We were out on the water for about 20 minutes until they told us we had to go back in as our turn was done. It was just as well because it was over 90 that day and we were getting really hot. We spent some time just walking around looking at some of the other stuff going on but there were lines for everything. Then the ice cream social started where they gave out bowls of vanilla ice cream for free. I got a HUGE bowl and it was yummy! I wish Nikki could have had some but she has some crazy food allergies and pretty much can't eat anything she doesn't make herself so that she knows what's in it. But it was a very good day and we both had a lot of fun! Now for a couple of pictures! And out on the river!